Here are my strategies to help promote health and healing after a blood clot. After my blood clots, I felt like a fish out of water – literally and figuratively. I could not breathe without an oxygen tank, and I also felt like I had no knowledge of what happened to me, or knowledge of what to expect during my recovery. I had no idea idea how to recover after a blood clot. Those feelings of inadequacy and frustration are some of the most devastating ones that I have ever experienced. I felt like I had lost all control over my life, and I had no idea how to regain control again. Recovery from blood clots is different for everyone. It can take weeks, months, or years, and some people struggle with complications that last even longer. My recovery was extensive – it took a couple of years – and I will be on anticoagulants long-term to prevent further blood clots. During my recovery, I often wished I had a plan to help me through it. 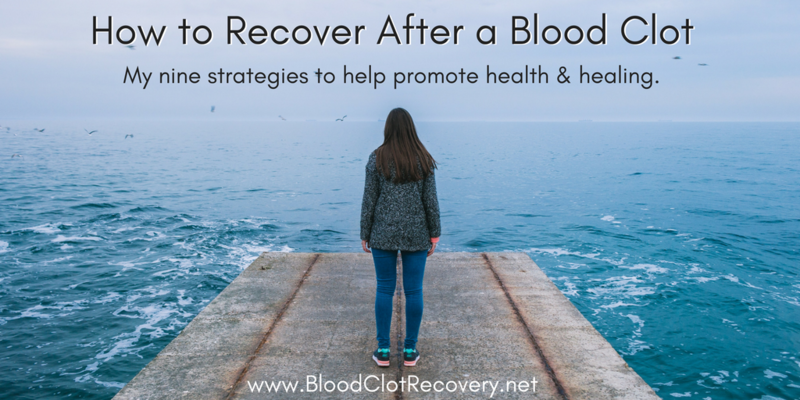 While no singular plan exists for recovering from a blood clot, because of how varied recovery can be from person to person, there are some simple strategies that I have learned that can help you promote healing and recovery in your life. How to recover after a blood clot. 1. Find a doctor who you can trust. One of the first, and most important things, that you can do during your recovery is to find a doctor who you trust. You should have no doubts that your doctor has your best interest in mind and will help you heal. If you don’t have a doctor who you consider a good partner in your care, find a new doctor. It is okay to get a second – or even a third – medical opinion about your health situation. 2. Follow your treatment plan. The standard treatment for blood clots are prescription medications known as anticoagulants, or blood thinners. While these medications don’t actually thin the blood, or dissolve blood clots, they do help to prevent new blood clots from forming, or old blood clots from breaking apart and traveling through the blood stream, which can lead to a life-threatening pulmonary embolism. The most common reason for a repeat blood clot is not following a treatment plan. Take your medication as prescribed and follow your doctor’s instructions. If you have questions, ask. Remember, you should feel comfortable communicating with your doctor at all times. 3. Understand your situation. Blood clot diagnosis, treatment, and recovery can be overwhelming – especially if you don’t know anything about blood clots. Take some time to learn about your situation, whether it be basic information about blood clots, clotting disorders, or even ways to prevent blood clots. Seek out information in books and online, but make certain that they are reputable sources, such as patient advocacy organizations, medical journals and academic publications. 4. Listen to your body. It can be difficult to know what’s normal and what’s not normal during recovery from a blood clot. Always listen to your body and what it might be trying to tell you. If you have new or worsening chest pain, shortness of breath, or headaches, always get in touch with your doctor right away. If you don’t know if what you are experiencing is normal or not, ask your healthcare team to help guide you. 5. Make overall healthy living a priority. Recovery from a blood clot can feel like pure “survival mode,” especially in the beginning, but don’t forget to take care of all aspects of your physical and emotional health. Try to eat healthy, drink plenty of water, move around when you can, sleep, relax, rest, and do a few things that you enjoy, even if they are small activities. If you’re getting ready to start a new eating or exercise plan, be sure to touch base with your doctor before you do. 6. Recognize there may be obstacles. It is often said that healing is not linear, or does not go in a straight line, and that’s true for healing from blood clots too. You will have days when you feel better, and then perhaps worse again. It’s important to understand that your recovery may have ups and downs, but if the hardships start to outweigh your progress, make sure you talk to your healthcare team about it. 7. Connect with your peers. It’s not uncommon for the people closest to you – your family and friends – to be equally confused and overwhelmed by your recovery. In fact, they may not understand what you are going through, and they may not understand that healing can be a lengthy process. It’s important to connect with people who do understand, and who share your experiences. You can find peer support groups online, on Facebook, and sometimes even in person. When searching for support groups, make certain that they are dependable, trustworthy, and expertly moderated. 8. Get professional help if you’re struggling emotionally. Recovery from blood clots is not just physical. It’s not uncommon for people to feel anxious, depressed, isolated, overwhelmed, angry, sad or stressed after a blood clot. Some people experience even more powerful circumstances, like grief and post-traumatic stress disorder. If you’re struggling psychologically after a blood clot, reach out to a professional counselor or psychologist. 9. Always remain hopeful. No matter how overwhelming recovery from a blood clot is, it’s important to remember that recovery is possible. Never give up, and never stop hoping that there will be better days ahead. Celebrate the small improvements and acknowledge the setbacks. In the end, you will emerge, perhaps even with new inspiration for experiencing the things that matter most to you. Remember, there is no right or wrong way to recover, and your experience may be entirely different from the next person’s experience. It can be a long journey – and there may be some frustrating setbacks – but recovery is possible. Ultimately, most people do recover from blood clots, and they do go on to lead normal lives, even if they have to take long-term anticoagulants to help prevent future blood clots. Recovery resources to get you started. Reader Writes In: What is the scariest part of blood clot recovery for you? What have you learned during recovery that can help other people? Share in the comments below. Recovery can take a long time and varies for each individual. Read more about what to expect and connect with others who are also recovering. Visit my Amazon Influencer Shop to get the products I use to stay healthy and happy every day. Blog stock photos courtesy of unsplash.